Thomas Lang was an outstanding concert pianist. He was elusive, arrogant, depressive, mysterious, and a genius. He died mysteriously, probably by his own hand. 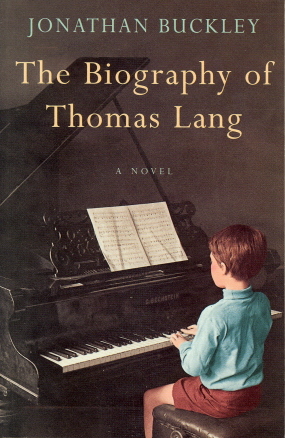 Bit by bit, in a volley of letters between his would-be biographer and Lang’s brother Christopher, his life is pieced together and the real Thomas Lang begins to emerge. Jonathan Buckley’s first novel ponders the nature of biography, the question of what a life is and, more particularly, what a life becomes once it is finished, who that life belongs to. Confident, endlessly inventive, often very funny, it is one of the most assured debuts in British fiction for some time. …in his accomplished first novel, Jonathan Buckley has invented Thomas Lang, a child prodigy who grows up to be a globe-trotting global star, and has been killed in a car crash, accident or suicide . . Buckley pulls off quite a feat: the person is put together as the image is taken apart. Popular notions of genius and creativity are fed, watered and then pulled up by the roots; biography also comes under attack…. We do not, in the end, discover whether the biography is written, but we are given, in the correspondence, a spontaneous and searching picture of the life. In the same way, while the book resists our sentimental preconceptions about the music, the passion and intelligence of the insights it contains leave us wanting to listen more. Buckley’s multilayered and captivating book illuminates and demystifies the processes of writing and memory. It confirms that the true subject of most biographies is the biographer. “And here come the quick in pursuit of the dead”. The first line is indicative of the playful intelligence at work in Buckley’s ambitious novel, which explores the illusive nature of biography, the unreliability of memory and the burden of genius . . a meticulously crafted and unexpectedly funny debut. An extraordinary achievement …intelligent, enjoyable and skilfully crafted. An accomplished first novel, by turns dry, knowing and – in the personality of the endlessly touring Thomas Lang glimpsed in his letters home – poignant. I read it spellbound …his inventiveness is limitless. …a tour-de-force of literary pastiche, engrossing like the best detective stories. This challenging and original book delights in thwarting the reader’s expectations.